Babone 5GO: Bob m'a eu ! Boy, that is very nice! The van, trailer and boat look great together! Nice job! Other then Ebay, the best place to buy is from Bill Arick. He lives in Kansas, USA. 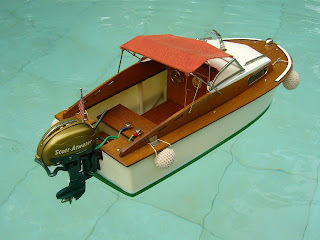 Bill sells toy outboard motors and boats. He also restores toy boats and motors. Unfortunately, he doesn't have email so you have to call him. His phone number is: 1-316-755-0581 or his home is: 1-316-755-1528. 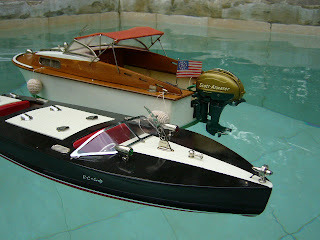 Here are some pictures of my real boat. It's a 1957 Switzer Craft Shooting Star. The motor is a 1958 Mercury Mark 58. I hope you like it. je ne l'ai plus...échangé contre une B14 ! le speedster de Richard je ne l'ai plus non plus : ça faisait très Marina pourtant ! et il m'envoie son VRAI hors-bord, ce n'est pas de jeu ! Je ne puis lutter avec Bob ! is bigger as mine !